I've said it before and I'll say it again: If the recent Ghostbusters film had come out a year later it would have been a smash hit. The timing was just a little bit off. We've seen a wave of successful female-led projects ever since, with Wonder Woman leading the way. Warner Bros. is continuing to push heavily in that direction with Birds of Prey, Supergirl, and Batgirl films all in development as part of the DCEU. And now one more may be in the works, centered on Justice League Dark member Zatanna. In Deadline's story about the upcoming slate of superhero films with female leads, they mention that a Zatanna film is being considered. There aren't any details, but that it was mentioned at the same time as previously-revealed Supergirl and Batgirl films suggest it's probably as much of a reality as they are. But it does sound like these projects are taking precedent over The Flash and Superman which don't really seem to be going anywhere. 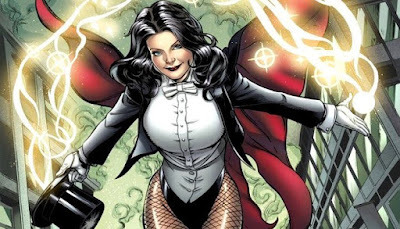 Zatanna was originally going to be part of Guillermo del Toro's Justice League Dark film before it got shelved. A stage musician with actual magic abilities, her extensive powers can be unleashed when she speaks the incantations backward. Who knows if this will ever happen. It's hard to peg down what the Hell is happening in the DCEU from one day to the next, but in theory a Zatanna film has potential to explore the mystical, paranormal side we haven't seen yet.